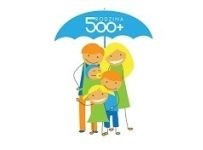 A ministerial program Family 500 plus kicks off today. You may apply until July ,1 2016. 1. The benefit is available for parents, legal or actual foster-parents. 2. The benefit is available until a child is 18 years old. 3. Parents will be given the benefit for the 2nd and another child regardless the income. 4. Parents will be given the benefit for the 1st and another child if the income-related criterion is fulfilled: PLN 800 net per person in the family or PLN 1200 net, if a family includes a disabled child. 5. Adult child after becoming 25 years old is taken into account to calculate the income in the family provided that they are still financially supported by parents. 6. Application will be filed every year in the place of residence. It can be done via internet, by post or in the Municipal Social Welfare Center. E-application can be filed via empatia.mrpips.gov.pl, PUE ZUS or e-banking. 7. If an application is filed within the first 3 months, parents will be compensated the whole sum of money due. If an application is filed until the end of June 2016 a benefit will be paid out with compensation from April. 8. At the beginning of the program local government will have 3 months to issue decision and pay the benefit out.